Sharing my Chili Tortellini today! 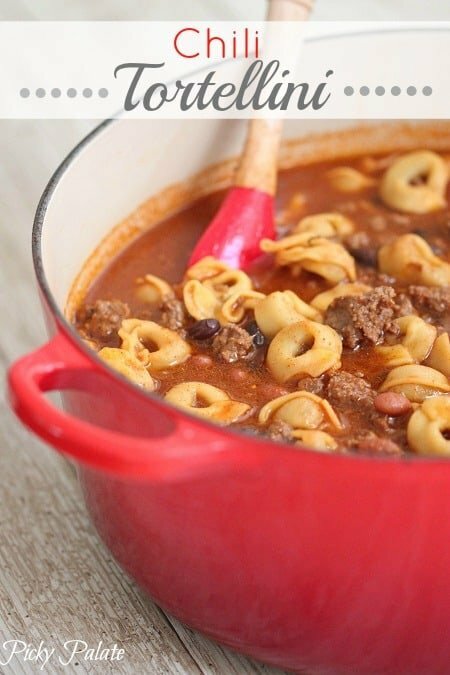 Kind of random, but last Sunday I was deciding what to make the boys and husband for dinner and just when I was going to make a pot of chili, I saw a package of tortellini in my pantry. 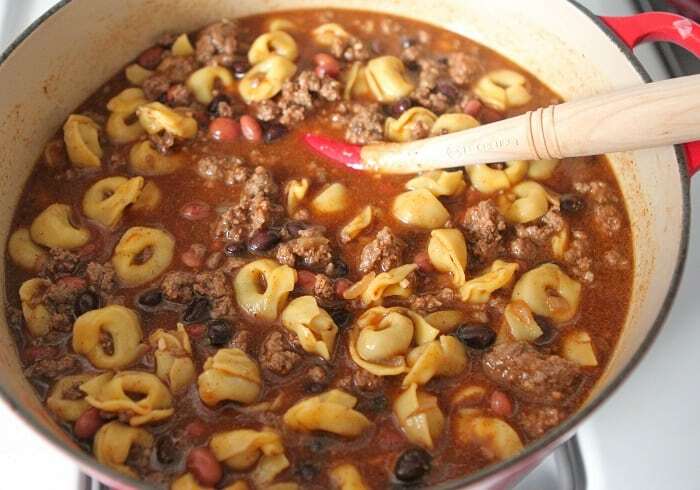 I thought, I do chili mac all the time so why not add tortellini to my chili?! The rest is history and we loved this speedy to make dinner. Here’s your line up. I found my tortellini at Trader Joe’s, but whatever brand you can find will work. Cook your tortellini according to the package directions. Cook al dente, careful to not overcook. 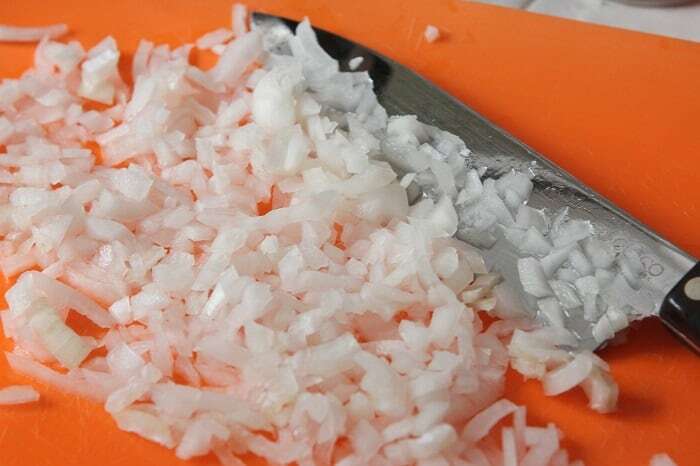 Saute your onion and garlic then brown the beef. Once browned, pour in your broth. 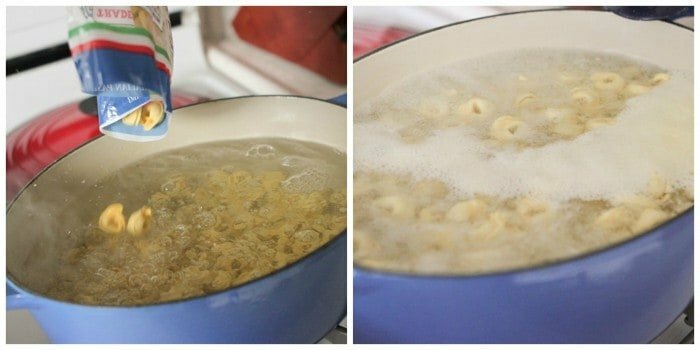 Add your cooked tortellini back to the pot. 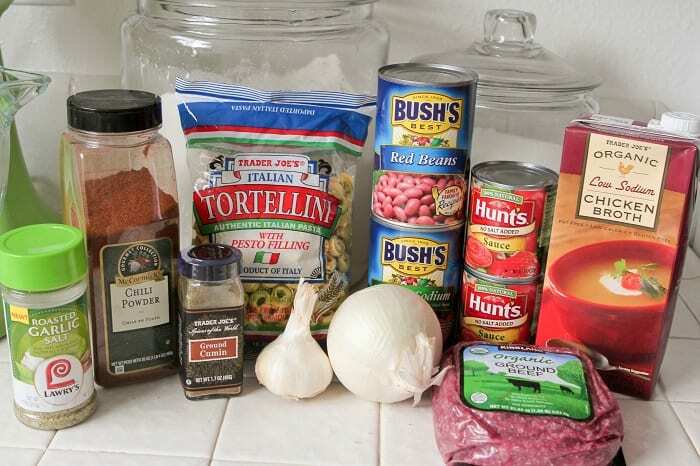 Add your beans and tomato sauce or diced tomatoes. I would suggest diced tomatoes. A little chili powder, then give a good stir. You’ll get a little pot of deliciousness that looks like this. Think chili mac but even better. Enjoy! Still Have Easter Ham To Use? Try This Panini! I’m sure I will like it a lot ! This is a very original idea and nothing can stop us to create, with pasta. I love that. This looks so good! I was searching for something to make for dinner tonight and this will be it. What a nice meal, I am sure nobody could resist it. Totally in love with this!! Best idea ever. Ooo, I can’t wait to make this. It is COOOLD here, ice storm and all, thanks Spring! So you better believe we have our fireplace going and soup type dishes sound GOOD. That is a guaranteed crowd pleaser!! Jenny, this is absolutely genius!!! Putting on my grocery list right now! that is a majorly tasty, hearty looking meal- my kids would love it! Yes please…this looks so delicious! Yay! Hope you and Kevin enjoy! 2 more weeks! Weeeee! I just printed this out to make tomorrow night- thank you!! 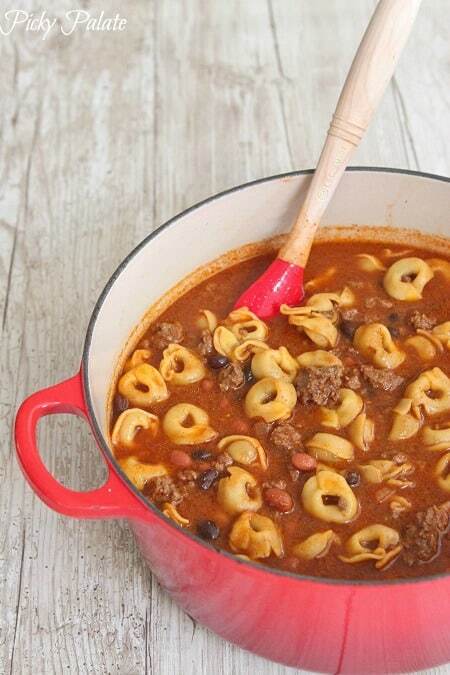 Mmm pasta in chili – this sounds so great! You show Hunts tomato sauce but mention Rotel – is it one or the other, but not both? Love the added cumin and cilantro. Thanks. Yum to the MAX! OOOH, I want it! Would it be alright to use frozen mini cheese tortellini? Hi, looks great! I was wondering–where do you get your organic ground beef? I have only found it at farmer’s markets, but this looks like a name brand. Thanks! Yummm! 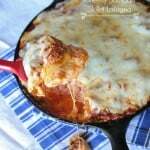 I wish I had everything to make this for dinner tonight! Yum! 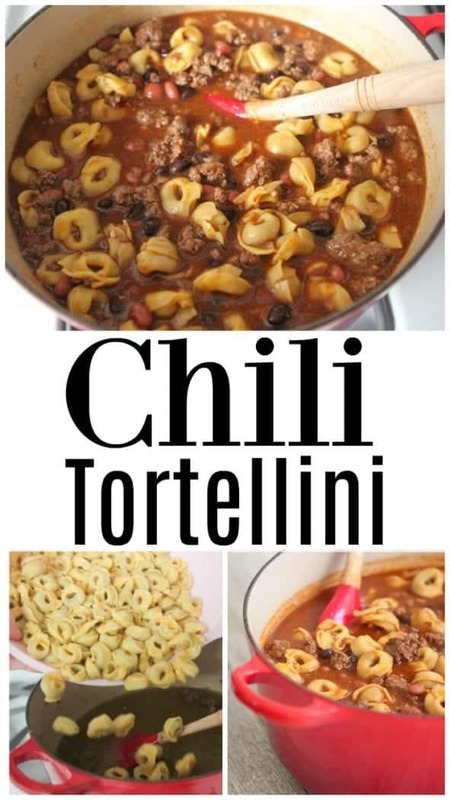 I love tortellini but haven’t really tried them in chili before! 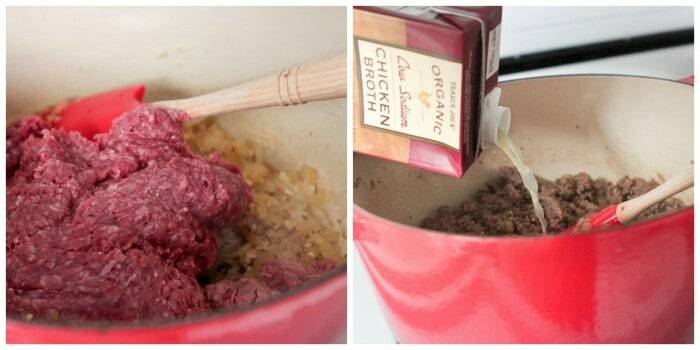 This looks super hearty and delicious! This looks and sounds amazing and can’t wait to make it!!!! 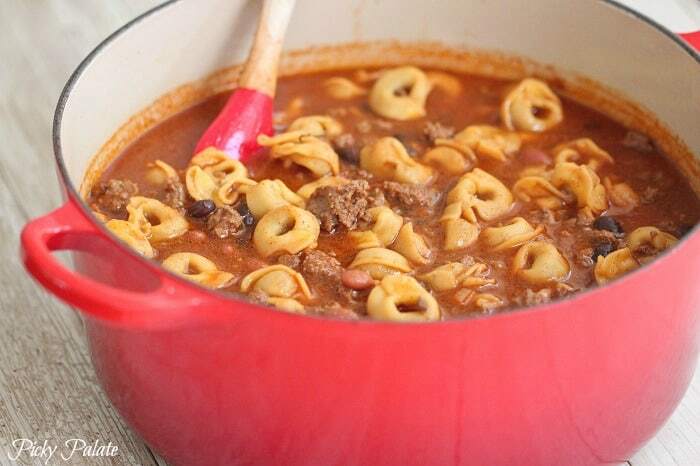 what a great idea to jazz up regular ‘ol chili with some tortellini!! i love the simplicity and the entire dish! Cheese + Chili + pasta are the best! Love how simple this is and I really want some now since it is snowing! Looks so good!! I have to make this soon, Jenny! Can’t wait to see you next month! What an awesome idea – such a yummy combination!!! This is one really tasty sounding tortellini! Who could say no to this, Jenny!! Delicious. This looks delicious! 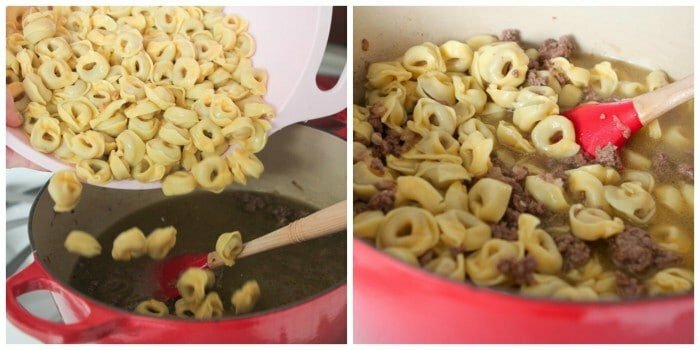 I bet you could just cook the tortellini right in the broth mixture. What a fun family dinner idea! I love it! I love those moments when you think “hey, let’s add this to that!” and it turns out YUM-O! This looks like one of those meals! I love how this rhymes! LOL! And I love your first photo, so simple yet makes me want to dive right into that big pot of comforting yumminess! I’m intrigued. I’m going to have to give this a try. I’m thinking cheese tortellini, though. Made this tonight with frozen tortellini and just cooked it right in the soup. It turned our GREAT! Added some Franks hot sauce while eating. Super yummy! Thanks for the great recipe. Nice add with the Franks hot sauce! Made this tonight and it was awesome! I had to make a couple of substitutions to use what I had on hand. I did use Rotel but only had original so I used 1 Tbsp of chili powder so it wouldn’t be too spicy for my son. I used black beans and a can of chili beans. I also added a small can of tomato paste because I really wanted it to have that nice red color and added flavor. I only had frozen tortellini so I just added it to the mixture as directed but straight from the freezer then let it sit and simmer about half an hour while waiting for my husband to get home. It was a perfect dinner on this cold, rainy ‘spring’ day. Great meal, except it was a little too spicy. I added a little sugar too, about 1/4 cup. That does look delicious – and I have almost all the ingredients! I can compromise with what I don’t have. Thanks for sharing! I made this earlier today and it turned out amazing!!!!! 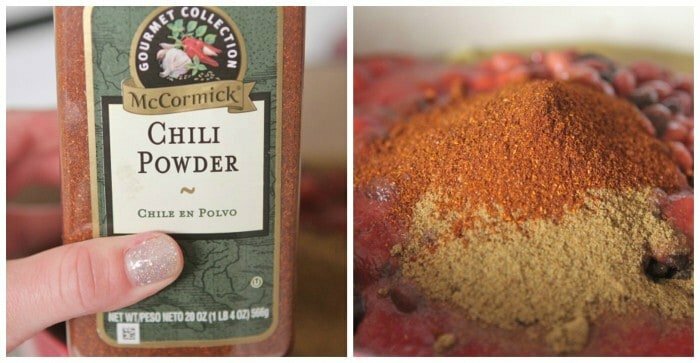 ^_^ super easy to make and i even got the recipe memorized by heart now when ever im craving me some chili i can just go out and make it ! thanks a lot !!!!! This sounds like a fantastic idea! Can’t wait to try it! Where can I buy dry tortellini in Florida, we do not have Trader Joe’s? I just may have to try the frozen kind like Nichole and hopefully it will turn out ok. This really sounds good! I saw this recipe at pinterest. I made it today. It was amazing! I made it with thai peppers to make it spicy. It so good that family of 5 finished in one sitting. Thank you so much for sharing your awesome creation with us. You’re welcome and thank you for commenting! 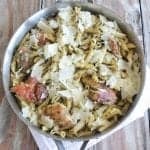 I just finished making this delicious recipe !! 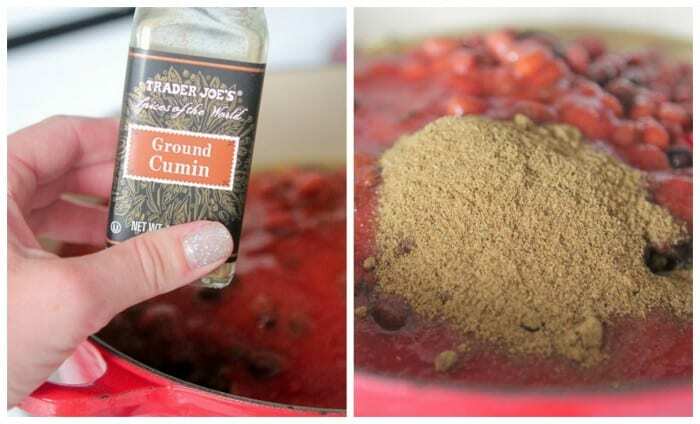 it’s super easy and fast to prepare, with ingredients I always have in my pantry/freezer. It taste delicious ! Will make again for sure ! This is just insane. And I thought your mac and cheese was mind blowing. This delish dish just topped it. Looks delicious! I am making it this weekend. I featured it on my Friday Five this week too.